It may be warm and springy where you are, but the weather here still makes a warm bowl of roasted cauliflower soup swirled with arugula pesto a good thing. Especially after being pelted with stinging hail and big drops of cold rain. Do you feel sorry for me yet? See my arugula pesto recipe for the details on that: for this soup, I make a straight arugula pesto without mint. The soup itself doesn’t have a complicated spicing: that’s because it starts with a homemade vegetable stock which is really good in itself. But it will also be good with boxed stock, though you might want to supplement that with little extra pepper, parsley, and so forth. I’ve taken to roasting vegetables for soup, often along with a head of garlic, before simmering them on the stove with the rest of the soup ingredients. Compared with sauteing them in olive oil on the stovetop, roasting takes a little longer but is less labor-intensive. It uses less (or no) oil, and it adds flavor by browning the vegetables nicely. 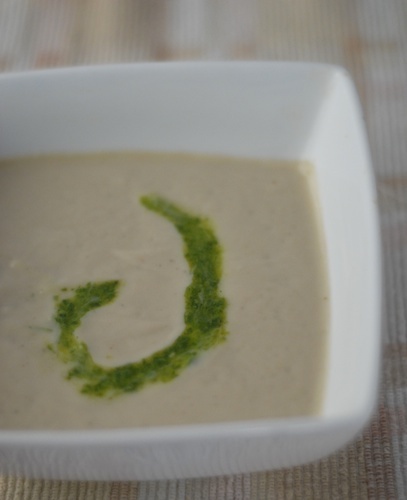 A nice hot roasted cauliflower soup to warm a cold winter (or spring!) day. Break cauliflower into small florets, place in large bowl. Drizzle with olive oil (optional) and mix. Cut top off of head of garlic, cutting tips off of each garlic clove. Pour a little olive oil over the garlic (optional). Place cauliflower florets and garlic on baking pan. Roast about half an hour, or until fragrant and browned. Squeeze five cloves from the head of roasted garlic to use in the soup, reserve the rest for another purpose. In a large pot, combine stock, cauliflower, garlic, and thyme. If you are using store-bought stock, consider adding a handful of parsley, two bay leaves, and a chopped onion. Simmer 15-30 minutes, until the cauliflower is completely soft. Once the vegetables are soft, remove the bay leaves (if you added them). Add milk (plain unsweetened soy or other). Blend in blender or food processor. If you are using a small or mid-sized blender, blend in batches, using caution with the hot liquid. In a Vitamix, this will only take one or two batches. Adjust salt and pepper to taste. Serve warm. Roasted Garlic Cauliflower Salad A roasted garlic cauliflower salad with steam-roasted cauliflower for your winter dining pleasure. Celery Root Soup Vegetable stock, celery root, and leek or onion combine to fill out the flavor of this celery root soup, while the cup of soy or other milk adds a bit of creaminess. 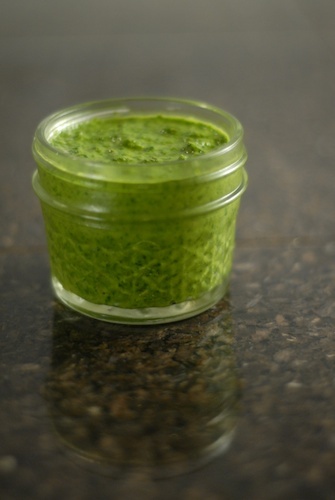 Arugula Mint Pesto This peppery, minty arugula pesto with a hit of lemon whips up quickly and is great for garnishing soup, on fish, or in a sandwich. Sweet Potato Vegetable Soup with Ginger, Cilantro, Coconut & Lime Based on vegetable stock and packed full of other vegetables like leeks, onions, and carrots. 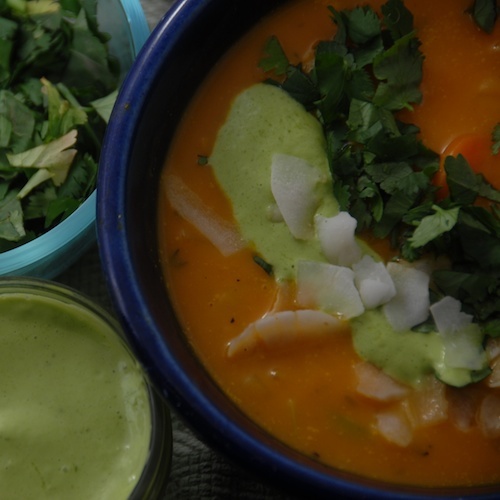 this sweet potato soup is enhanced with a whole variety of flavors from roasted garlic to cilantro to lime juice, curry powder, and jalapeno. Includes four garnishes. 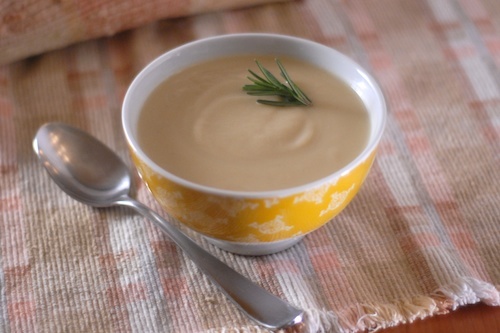 Ooh you have a cauliflower soup recipe too – looks great. I bet it would be delicious with raw whole milk or cream (if you can handle dairy) or ‘cashew milk’ made at home. Love that you roast the cauliflower first — I bet it’s tastier that way. I’ll try your version soon, especially with the arugula pesto! Thanks for the inspiration! Thanks, Heba! Yeah, I’m on a roll lately with roasting the vegetables, it does add flavor. I love the taste of cashew, unfortunately it doesn’t love me back! Too bad, because there are so many interesting recipes now using cashew cream. At times I can handle dairy, but not now. I did love making yogurt, maybe I’ll be able to again sometime.